“Behold”, the voice of one crying out! The word behold itself makes me look, wonder, who is he talking about? Mark captures this image of John the Baptist proclaiming this message of Jesus to everyone over 2,000 years ago. This same message is present for all of us today. It’s such a blessing to hear and share the word with others knowing we are preparing each other for an eternity with him. The kingdom of God is at hand. Jesus proclaimed the word and performed miracles with everyone providing support to their faith. Jesus has performed miracles in my life. I’m not worthy, but grateful. I pray to for our courageousness to share this good news with others and opening our eyes to witness the daily miracles around us. Helping us all to be prepared for him. To the eyes John wore camel hair and ate locust with honey. This image could possibly scare someone or start a new fad diet these days. Either way, John’s faith and message of Jesus would change your life. “Behold!”At a time when some people were waiting for Jesus to come, John shared and prepared others for Jesus. John baptizes many telling those baptized, Jesus will baptize you by the Holy Spirit. Jesus wants us to repent for our sins asking for forgiveness. We need to build our relationship with him by faith and obey his word. 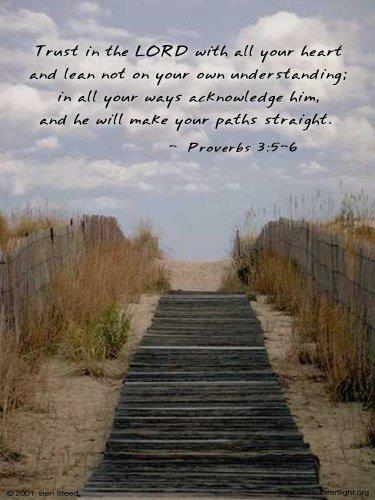 (making our paths straight) In what ways are we preparing others for a relationship with God? Jesus has prepared our way and provided us with a way to live our lives. I recently heard, “We have been changed, and being changed“(Sanctified – Sanctification). It’s an on-going process. Jesus said, “Follow me, and I will make you fishers of men”. And immediately they left their nets and followed him(17-18). When we immediately do this we see the miracles he performs. When we do things at our time often our path goes off track and we need some spurring from God or fellow believers to get us back on. I’m grateful for the spurring I receive from all of you. Paul reminds me in Romans 1:17 God is revealed from faith for faith. Having faith he has prepared a path just for you. We strive to have our path that is righteous by faith. Apart from faith, we have no hope in life. Thank you God for preparing our path to you. What path are you on? Previous Previous post: The Price of Sin and the Value of Grace.